When visiting Northeast Montana, prepare yourself for a star-studded evening. More room to roam means more space to explore, and on the prairie, that means 360 degrees of spectacular views of the Milky Way and Northern Lights. Trust us - this is a place you have to see for yourself. Below are a few suggested places to stargaze, however, when light pollution is next to none and the expanse of open spaces stretch for miles, pretty much anywhere is the best seat in the house. Aptly named for the pine trees in the area, The Pines Recreation Area is located along Fort Peck Lake. With great points along high hills, this spot is great for a night hike with stunning views. Located just south of Sidney, Seven Sisters Wildlife Management Area is a hidden gem located along the Yellowstone River. The Little Rocky Mountains is a prominent mountain range in the heart of Missouri River Country. Located far from any major towns, this is a great spot to take in the stars. Situated on Fort Peck Lake, Hell Creek State Park is located in the darkest night sky rating possible. It also plays host to a campground, making it a convenient place to watch the show. Located on the eastern border of Montana and North Dakota, Brush Lake State Park is a quiet and beautiful place to spend the evening watching the galaxies. 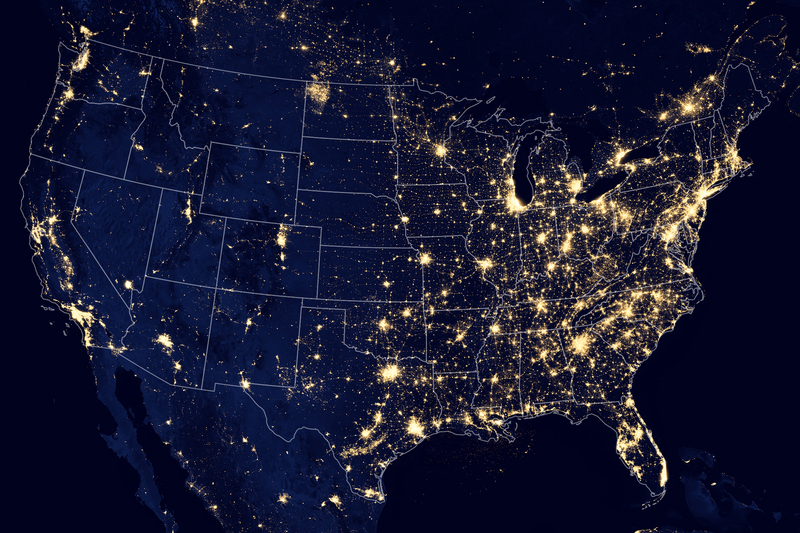 Light pollution map of the United States. 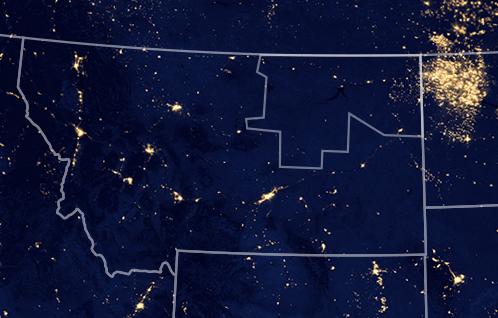 Montana shows very little light pollution. 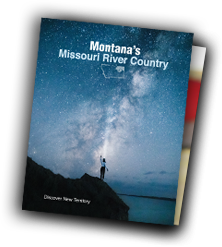 Truly dark night skies dance above you in Missouri River Country, where the vast majority of our region's skies remain uninterrupted from light pollution. Light pollution occurs in areas where man-made lights, such as those found in towns and cities, brighten the skies and cause disruption to the clarity and visibility. Even smaller towns can leave a trail of light pollution behind. According to Sky and Telescope, "a typical suburban sky today is about 5 to 10 times brighter at the zenith than the natural sky. In city centers the zenith may be 25 or 50 times brighter than the natural background." This means that in order to see the galaxies uninterrupted, you have to travel far away from any town or city, to somewhere like, say, the middle of nowhere. Luckily for us in Missouri River Country, we are quite literally the middle of nowhere and proud of it According to an Oxford University study which used population data to find the literal “middle of nowhere," the top three most remote spots in the country are found right here in Northeast Montana, with Glasgow taking the number one spot and Scobey and Wolf Point claiming second and third. Less people means less lights, which means less light pollution. 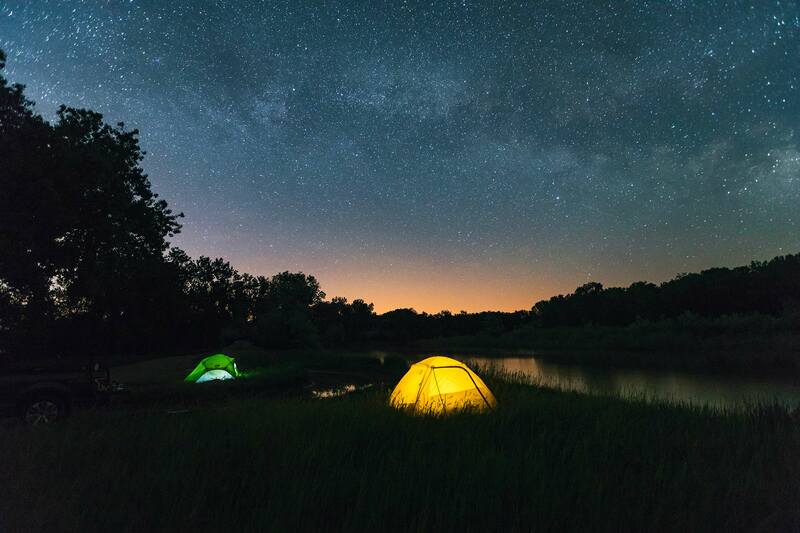 Take in some of the darkest night skies in the country here in Missouri River Country, where every night is a star-studded affair. Light pollution map of Montana. Missouri River Country is outlined in the Northeast corner.